For the artificial candy, see jujube (confectionery). "Jujubee" redirects here. For the person, see Jujubee (drag queen). Jujube fruit naturally turns red upon drying. 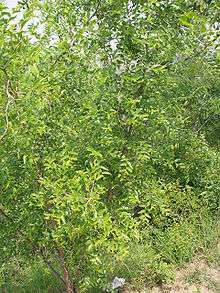 It is a small deciduous tree or shrub reaching a height of 5–12 metres (16–39 ft), usually with thorny branches. 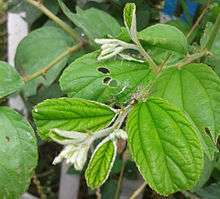 The leaves are shiny-green, ovate-acute, 2–7 centimetres (0.79–2.76 in) wide and 1–3 centimetres (0.39–1.18 in) broad, with three conspicuous veins at the base, and a finely toothed margin. The flowers are small, 5 millimetres (0.20 in) wide, with five inconspicuous yellowish-green petals. The fruit is an edible oval drupe 1.5–3 centimetres (0.59–1.18 in) deep; when immature it is smooth-green, with the consistency and taste of an apple, maturing brown to purplish-black and eventually wrinkled, looking like a small date. There is a single hard stone similar to an olive stone. Its precise natural distribution is uncertain due to extensive cultivation, but is thought to be in southern Asia, between Lebanon, northern India, and southern and central China, and possibly also southeastern Europe though more likely introduced there. This plant has been introduced in Madagascar and grows as an invasive species in the western part of the island. This plant is known as the "hinap" or "finab" in the eastern part of Bulgaria where it grows wild but is also a garden shrub, kept for its fruit. The fruit is picked in the autumn. The trees grow wild in the eastern Caribbean, and are reported to exist in Jamaica and Trinidad as well. In Antigua and Barbuda, the fruit is called "dumps or "dums". It is also known as "pomme surete" on the French islands of the Caribbean. This fruit, more precisely known as "Indian jujube" elsewhere, is different from the "jujube" fruit that is cultivated in various parts of southern California. The species has a curious nomenclatural history, due to a combination of botanical naming regulations, and variations in spelling. It was first described scientifically by Carl Linnaeus as Rhamnus zizyphus, in Species Plantarum in 1753. Later, in 1768, Philip Miller concluded it was sufficiently distinct from Rhamnus to merit separation into a new genus, in which he named it Ziziphus jujube, using Linnaeus' species name for the genus but with a probably accidental single letter spelling difference, "i" for "y". For the species name he used a different name, as tautonyms (repetition of exactly the same name in the genus and species) are not permitted in botanical naming. However, because of Miller's slightly different spelling, the combination correctly using the earliest species name (from Linnaeus) with the new genus, Ziziphus zizyphus, is not a tautonym, and was therefore permitted as a botanical name. This combination was made by Hermann Karsten in 1882. In 2006, a proposal was made to suppress the name Ziziphus zizyphus in favor of Ziziphus jujuba, and this proposal was accepted in 2011. Ziziphus jujuba is thus the correct scientific name for this species. Jujube fruit is known by a variety of names. In the Caribbean, it is also known as jojo. In Zimbabwe (shona), it is known as "masawu". In Arabic-speaking regions the jujube and alternatively the Ziziphus lotus are closely related to the lote-trees ("sing. "sidrah", pl. "sidr") which are mentioned in the Quran, while in Palestine it is rather the Ziziphus spina-christi that is called sidr. Jujube was domesticated in south Asia by 9000 BCE. Over 400 cultivars have been selected. The tree tolerates a wide range of temperatures and rainfall, though it requires hot summers and sufficient water for acceptable fruiting. Unlike most of the other species in the genus, it tolerates fairly cold winters, surviving temperatures down to about −15 °C (5 °F). This enables the jujube to grow in mountain or desert habitats, provided there is access to underground water throughout the summer. The species Ziziphus jujuba grows in cooler regions of Asia. Five or more other species of Ziziphus are widely distributed in milder climates to hot deserts of Asia and Africa. In Madagascar, jujube trees grow extensively in the western part of the island, from the north all the way to the south. It is widely eaten by free ranging zebus, and its seeds grow easily in zebu feces. It is an invasive species, threatening mostly protected areas. The freshly harvested, as well as the candied dried fruit, are often eaten as a snack, or with coffee. Smoked jujubes are consumed in Vietnam and are referred to as black jujubes. Both China and Korea produce a sweetened tea syrup containing jujube fruit in glass jars, and canned jujube tea or jujube tea in the form of teabags. To a lesser extent, jujube fruit is made into juice and jujube vinegar (called 枣醋 or 红枣醋 in Chinese). They are used for making pickles (কুলের আচার) in west Bengal and Bangladesh. In China, a wine made from jujube fruit is called hong zao jiu (红枣酒). Sometimes pieces of jujube fruit are preserved by storing them in a jar filled with baijiu (Chinese liquor), which allows them to be kept fresh for a long time, especially through the winter. Such jujubes are called jiu zao (酒枣; literally "alcohol jujube"). The fruit is also a significant ingredient in a wide variety of Chinese delicacies.. In Vietnam and Taiwan, fully mature, nearly ripe fruit is harvested and sold on the local markets and also exported to Southeast Asian countries. The dried fruit is used in desserts in China and Vietnam, such as ching bo leung, a cold beverage that includes the dried jujube, longan, fresh seaweed, barley, and lotus seeds. In Korea, jujubes are called daechu (대추) and are used in daechucha teas and samgyetang. In Croatia, especially Dalmatia, jujubes are used in marmalades, juices, and rakija (fruit brandy). In Lebanon, Jordan, and other Middle Eastern countries, the fruit is eaten as snacks or alongside a dessert after a meal. On his visit to Medina, the 19th-century English explorer, Sir Richard Burton, observed that the local variety of jujube fruit was widely eaten. He describes its taste as "like a bad plum, an unrepentant cherry and an insipid apple." He gives the local names for three varieties as "Hindi (Indian), Baladi (native), Tamri (date-like)." In Palestine a hundred years ago, a close variety was common in the Jordan valley and around Jerusalem. The bedouin valued the fruit, calling it nabk. It could be dried and kept for winter or made into a paste which was used as bread. In Persian cuisine, the dried drupes are known as annab, while in neighboring Azerbaijan, it is commonly eaten as a snack, and is known as innab. These names are related, and the Turks use a similarly related name, hünna. Z. jujuba grows in northern Pakistan and is known as innab, commonly used in the Tibb system of medicine. Confusion in the common name apparently is widespread. The innab is Z. jujuba: the local name ber is not used for innab. Rather, ber is used for three other cultivated or wild species, e.g., Z. spina-christi, Z. mauritiana, and Z. nummularia in Pakistan and parts of India and is eaten both fresh and dried. Often, the dry fruit (ber) was used as a padding in leather horse saddles in parts of Baluchistan in Pakistan. The Arabic name sidr is used for Ziziphus species other than Z. jujuba. Traditionally in India, the fruit is dried in the sun and the hard nuts are removed. Then, it is pounded with tamarind, red chillies, salt, and jaggery. In some parts of the Indian state of Tamil Nadu, fresh whole ripe fruit is crushed with the above ingredients and dried under the sun to make cakes called ilanthai vadai or regi vadiyalu (Telugu). In Madagascar, jujube fruit is eaten fresh or dried. People also use it to make jam. A jujube honey is produced in the Atlas Mountains of Morocco. Italy has an alcoholic syrup called brodo di giuggiole. In Senegal Jujube is called Sii dem and the fruit is used as snack. The fruit is turned into dried paste used by school kids. The fruit and its seeds are used in Chinese and Korean traditional medicine, where they are believed to alleviate stress, and traditionally for anti-fungal, anti-bacterial, anti-ulcer, anti-inflammatory purposes and sedation, antispastic, antifertility/contraception, hypotensive and antinephritic, cardiotonic, antioxidant, immunostimulant, and wound healing properties. A controlled clinical trial found the fruit helpful for chronic constipation. In another clinical trial, jujube was proved to be effective against neonatal jaundice. In Persian traditional medicine it is used in combination with other herbal medicines to treat colds, flu and coughing. Research suggests jujube fruit has nootropic and neuroprotective properties. Ziziphin, a compound in the leaves of the jujube, suppresses the ability to perceive sweet taste. The fruit, being mucilaginous, is very soothing to the throat and decoctions of jujube have often been used in pharmacy to treat sore throats. The jujube's sweet smell is believed to make teenagers fall in love, and as a result, in the Himalaya and Karakoram regions, boys take a stem of sweet-smelling jujube flowers with them or put it on their hats to attract girls. In the traditional Chinese wedding ceremony, the jujube was often placed in the newlyweds' bedroom as a good luck charm for fertility, along with peanuts, longan, and chestnuts, punning on an invocation to "have an honored child soon". In Bhutan, the leaves are used as a potpourri to help keep homes smelling fresh and clean. It is also used to keep bugs and other insects out of the house and free of infestation. In Japan, the natsume has given its name to a style of tea caddy used in the Japanese tea ceremony, due to the similar shape, and also to nightlights (ナツメ球), again due to the similarity between the shape of the bulb and the fruit. In Korea, the wood is used to make the body of the taepyeongso, a double-reed wind instrument. The wood is also used to make Go bowls, beads, and violin parts. In Madagascar, jujube trees are a good wood for charcoal, the second main source of cooking energy. 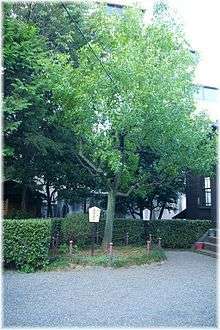 Witch's brooms, prevalent in China and Korea, is the main disease affecting jujubes, though plantings in North America currently are not affected by any pests or diseases. 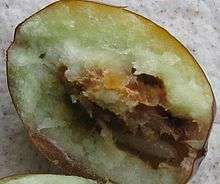 In Europe (Croatia in this case on the picture) last several years there is a problem with jujubes (some 80%-90% of the crop) eaten by insect larvae, including those of the false codling moth, Thaumatotibia (Cryptophlebia) leucotreta. Jujube date attacked by larva. 1 2 3 Rushforth, K. (1999). Trees of Britain and Europe. Collins ISBN 0-00-220013-9. ↑ Clarke, D. L. (1988). W. J. Bean Trees and Shrubs Hardy in the British Isles, Supplement. John Murray ISBN 0-7195-4443-2. ↑ Kirkbride, Joseph H.; Wiersma, John H.; Turland, Nicholas J. (2006). "(1753) Proposal to conserve the name Ziziphus jujuba against Z. zizyphus (Rhamnaceae)". Taxon. International Association for Plant Taxonomy. 55 (4): 1049–1050. doi:10.2307/25065716. Retrieved 30 January 2013. ↑ Barrie, Fred R. (2011). "Report of the General Committee: 11". Taxon. International Association for Plant Taxonomy. 60 (4): 1211–1214. Retrieved 30 January 2013. ↑ Elsie, Robert (1998). "Dendronymica Albanica: A survey of Albanian tree and shrub names" (PDF). Zeitschrift für Balkanologie. 34: 30. Retrieved 15 August 2015. ↑ Gupta, Anil K. "Origin of agriculture and domestication of plants and animals linked to early Holocene climate amelioration", Current Science, Vol. 87, No. 1, 10 July 2004, 59. Indian Academy of Sciences. ↑ S. Chaudhary. "Rhamnaceae" in: S. Chaudhary (Ed). Flora of the Kingdom of Saudi Arabia. Vol II (Part One) 2001. 1 2 3 Edible Medicinal and Non-Medicinal Plants. Volume 5, Fruits. Lim, T.K. Dordrecht: Springer Science+Business Media. 2013. p. 580. ISBN 978-9400756526. ↑ Easton, M.G., M.A., D.D. (1893) 'Illustrated Bible Dictionary and Treasury of Biblical History, Biography, Geography, Doctrine, and Literature With Numerous Illustrations and Important Chronological Tables and Maps. T. Nelson and Sons, London, Edinburgh and New York. p.688. "It overruns a great part of the Jordan valley." ↑ Naftali, T.; Feingelernt, H.; Lesin, Y.; Rauchwarger, A.; Konikoff, F.M. (2008). "Ziziphus jujuba extract for the treatment of chronic idiopathic constipation: A controlled clinical trial". Digestion. 78 (4): 224–228. doi:10.1159/000190975. PMID 19142004. ↑ Ebrahimi, Sedigheh; Soheil Ashkani Esfahani; Azizollah Poormahmudi (2011). "Investigating the efficacy of Zizyphus jujuba on neonatal jaundice". Iranian Journal of Pediatrics. 21 (2): 320–324. ↑ Pahuja, M; Mehla J; Reeta KH; Joshi S; Gupta YK. (2011). "Hydroalcoholic extract of Zizyphus jujuba ameliorates seizures, oxidative stress, and cognitive impairment in experimental models of epilepsy in rats". Epilepsy Behav. 21 (4): 356–363. doi:10.1016/j.yebeh.2011.05.013. ↑ Ralph E. Carson (2012). The Brain Fix: What's the Matter with Your Gray Matter: Improve Your Memory, Moods, and Mind. HCI Books. p. 157. ISBN 978-0-7573-1629-6. ↑ Chen, J; Yan AL; Lam KY; Lam CT; Li N; Yao P; Xiong A; Dong TT; Tsim KW (2014). "A chemically standardized extract of Ziziphus jujuba fruit (Jujube) stimulates expressions of neurotrophic factors and anti-oxidant enzymes in cultured astrocytes". Phytotherapy Research. 28 (11): 1727–30. doi:10.1002/ptr.5202. ↑ Kurihara, Y. (1992). "Characteristics of antisweet substances, sweet proteins, and sweetness-inducing proteins". Crit Rev Food Sci Nutr. 32 (3): 231–252. doi:10.1080/10408399209527598. PMID 1418601. ↑ Martin, Laura C. (2007). Tea: the Drink that Changed the World. Rutland, Vermont: Tuttle. p. 91. ISBN 0-8048-3724-4. Fruits of Warm Climates. Julia. F. Morton, Yan Lin Aung, FL: 1986. Wikimedia Commons has media related to Ziziphus jujuba.